The prize of “the Petite Aiguille” category has been won by the Pilot Big Date Special. The jury of the Geneva Watchmaking Grand Prix has thereby rewarded the elegance and unimpeachable functionality of this chronograph. Geneva, November 15th, 2012. The Geneva watchmaking Grand Prix aims to salute excellence in the field of watchmaking. Eleven prizes reward the finest creations and the most important operators in the watchmaking sector. 70 models were competing in the various categories, and a model from the Manufacture Zenith was honoured by the Grand Prix jury for “the Petite Aiguille” category at the prize-giving ceremony held in Geneva’s Grand Théâtre this Thursday. 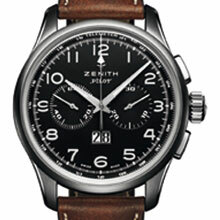 Through the stellar PILOT collection, Zenith is reasserting its legitimacy and its expertise in the field of aviation. The brand has indeed been accompanying aviation history from its beginnings by producing time measurement instruments used to help pilots in flying aircraft, notably including onboard counters. 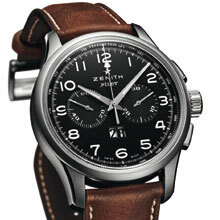 Since 1865, Zenith is THE benchmark in terms of precision and reliability – twin qualities that are indispensable in the aeronautical field. Echoing the historic chronograph watch from the 1960-80s, the new Pilot Big Date Special has functionality as its guiding principle. Its steel case is a moderate 42 mm in diameter, with classically styled alternating polished and satin-brushed finishes. The matt black dial, sandblasted five times, sets off the time displays, which visually are in perfect balance. The small seconds counter is at 9 o’clock, exactly opposite the 30-minute counter at 3 o’clock. Both feature a snailed decoration. A pair of hands treated with black ruthenium and highlighted with Superluminova mark the hours and minutes in a decisively masculine and modern style. Their sporty, dynamic shape matches the refined graphic style of the Arabic numerals that pay simple and solemn tribute to those of the 1960 chronograph. Behind the scenes, the El Primero 4010 calibre ticks away with an exceptionally consistent beat. Its finishes can be seen through the sapphire caseback. The winding rotor is decorated with thin Côtes de Genève in the purest watchmaking tradition. Founded in Le Locle in 1865 by a visionary watchmaker, Georges Favre-Jacot, the Manufacture Zenith earned swift recognition for the precision of its chronometers with which it has won 2,333 chronometry prizes in a century and a half of existence – an absolute record in terms of pocket watches, onboard timers and wristwatches. Having earned fame thanks to its legendary El Primero calibre – an integrated automatic column-wheel chronograph movement launched in 1969 and endowed with a high frequency of 36,000 vibrations per hour that ensures short-time measurements accurate to the nearest 1/10th of a second – the Manufacture Zenith has since developed over 600 movement variations. All Zenith watches are now fitted with an in-house Zenith movement and are developed and produced from start to finish by the Manufacture in Le Locle. The latter currently stands at the exact spot where its founder built the first company workshop – thus physically embodying a continuity that is a rarity in itself. Finishings: Oscillating weight with “Côtes de Genève” pattern.